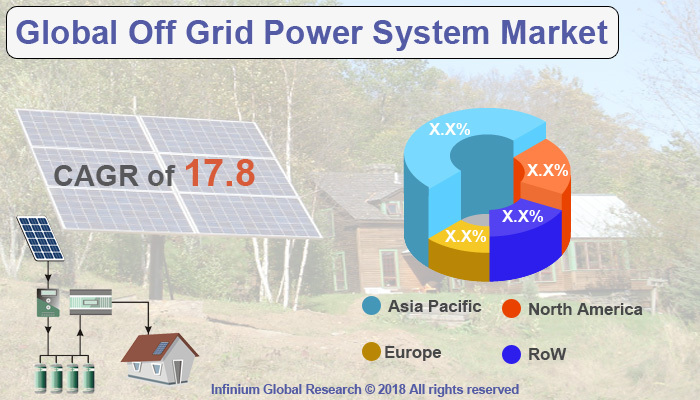 A recent report published by Infinium Global Research on off grid power system market provides in-depth analysis of segments and sub-segments in global as well as regional off grid power system market. The study also highlights the impact of drivers, restraints and macro indicators on the global and regional off grid power system market over the short term as well as long term. The report is a comprehensive presentation of trends, forecast and dollar values of global off grid power system market. According to report the global off grid power system market is projected to grow at a CAGR of 17.8% over the forecast period of 2018-2024. Off-grid solar power systems are impartial systems that help households, commercial and industrial buildings, mining sites, and telecom sector to generate their own power. These systems are not connected to the grid for the generation of power. When the utility power is unavailable or too expensive to bring to home or commercial properties, solar panels or wind turbines allows becoming its own utility. When utility power is not accessible DC solar power is less expensive than AC solar power because an inverter is not required to convert the electricity produced by solar panels and stored in batteries from DC to AC. The general range for a solar battery's useful lifespan is between 5 and 15 years. Solar batteries are significantly impacted by temperature, so protection the battery from freezing or blistering temperatures can increase its useful life. Increased consumption of energy and depleting natural resources have increased the sales of the off-grid power supply which drives the growth of the off-grid power system market. In addition, the demand for offshore wind energy plants for remote sensing is boosting the growth of the off grid power system market. However, High installation cost compared to other power generating sources are the factors restraining the growth of the off-grid power system market. Furthermore, the declining costs of decentralized renewable technology, the affordability, and ease of access to off-grid technologies has increased which in turn is anticipated to bring favorable opportunities for the off-grid power system market. On the other hand, the Government of India scheme designed to provide continuous power supply to rural India in September 2017 by the launch of Pradhan Mantri Sahaj Bijli Har Ghar Yojana or ‘Saubhagya’ Scheme. The objective of the Saubhagya scheme is to provide energy access to all through last mile connectivity, reaching all remaining un-electrified households in rural and urban areas with electricity, to achieve universal household electrification in the country by end of 2019. Among the geographies, Asia Pacific dominated the off-grid power system market. According to the International Energy Agency, India stands out as one of the largest electrification success stories in history accounting for 2 out of every 5 people gaining access to electricity who hadn’t previously had access, since 2000. The report on global off grid power system market covers segments such as types and end-users. On the basis of types, the global off grid power system market is categorized into DC only system, mixed DC and AC system, AC only system, AC system with wind and solar and AC system with back-up. On the basis of end-users, the global off grid power system market is categorized into oil & gas, wind and weather, and monitoring stations. The report provides profiles of the companies in the global off grid power system markets such as Koninklijke Philips N.V, Niwasolar, Tata Power Solar Systems Ltd., SunnyMoney, Omnivoltaic Power Co. Ltd., WakaWaka, BBOXX Ltd., Sinoware Technology Co. Ltd., and Azuri Technologies Ltd. The report provides deep insights on demand forecasts, market trends, and micro and macro indicators. In addition, this report provides insights into the factors that are driving and restraining the global off grid power system market. Moreover, IGR-Growth Matrix analysis given in the report brings insight into the investment areas that existing or new market players can consider. The report provides insights into the market using analytical tools such as Porter's five forces analysis and DRO analysis of off grid power system market. Moreover, the study highlights current market trends and provides forecast from 2018-2024. We also have highlighted future trends in the off grid power system market that will impact the demand during the forecast period. Moreover, the competitive analysis given in each regional market brings insight into the market share of the leading players. This report will help manufacturers, suppliers, and distributors of the off grid power system market to understand the present and future trends in this market and formulate their strategies accordingly.